Big South is proud to present two shows as part of London Jazz Festival 2017. London Jazz Festival comes to Croydon this November. For the first time Croydon will host performances for this London-wide event as the festival marks it’s 25th anniversary. 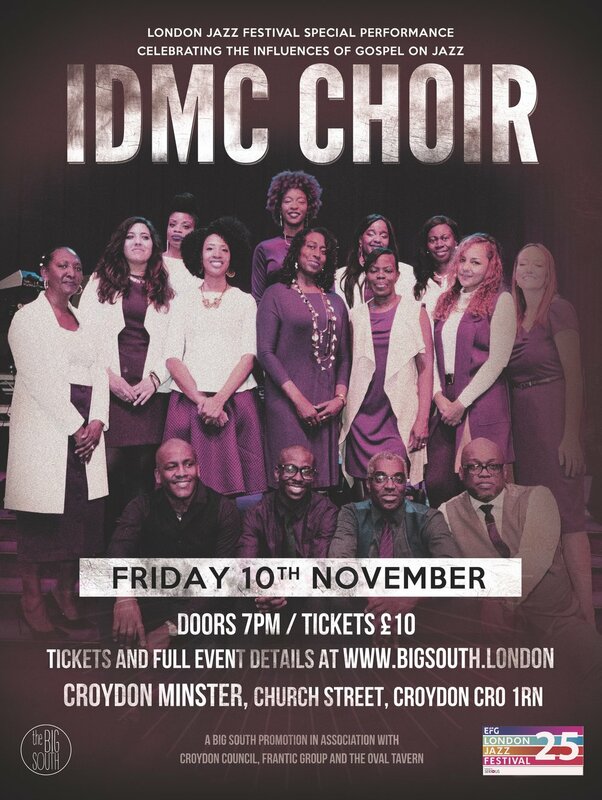 On Friday 10th November, MOBO nominated gospel choir, IDMC will perform at Croydon Minster, Church Street, Croydon. This hometown show for the choir, that has toured with Michael Jackson and sung for Pavarotti on his birthday, will explore the influence of gospel music on jazz and include excerpts of the jazz opera ‘Porgy and Bess’. Doors 7pm, tickets £10. Then, on Thursday 16th November, seven-time Grammy nominee The Floacist curates and headlines a special evening at Stanley Halls (South Norwood Hill, SE25) celebrating the on-going cultural explosion in South London that has witnessed the emergence of some of the most exciting young British jazz talent for many years. Joining Floacist on the line-up are Maisha, Triforce and DJ Dave Koor (Albert’s Favourites). Doors 7pm, tickets £15.